A classic album and well worth a place in the collection of anyone enjoys melodic, early eighties Melodic Rock. 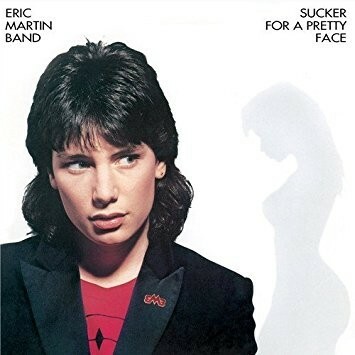 Best known as the vocalist for Mr. Big, Eric Martin first came to real prominence with the band 415, who would score a record deal and be renamed the Eric Martin Band. With a manager who also handled Journey, a great singer who wrote some damn fine songs and a tight band, big things were expected. Sadly, 'Sucker For A Pretty Face' was the group's one and only album – but what an album it was. Kicking off with the title track, the band set their stall out early with a bouncy Pop Rock tune resplendent with a great hook topped off by Martin's distinctively soulful voice. 'Don't Stop' was a killer Rock tune originally written and recorded by Frankie Miller, but EMB give it even more crunch and power. And the goodies just kept coming... the punchy 'Private Life' is another winner, as is the exceedingly catchy 'Ten Feet Tall'. The beautiful 'Letting It Out' showed Martin's phenomenal ability when handling a ballad while 'Just Another Pretty Boy' is glorious "radio-friendly" Pop Rock. 'One More Time' has a Jackson 5 groove to it while 'Catch Me If You Can' is another high quality foot tapper. The serene 'Love Me' closes out a killer record. If you're only going to make one album, you might as well make it quality from start to finish. This typically excellent Rock Candy re-master not only documents the trials and tribulations of EMB, but also loads up the back end of the disc with some excellent bonuses. The band's pulsating cover of The Supremes 'Stop In the Name Of Love' has been added, along with four live tracks which were recorded at the Blaisdell Arena in Honolulu, 1983. These live offerings are a stunning representation of the band, pulsing with energy and vibrancy. I'm lucky enough to have the full show as a bootleg and these versions with the RC mastering treatment sound immense. After the demise of Eric Martin Band, the man himself would record two superb solo records before joining up with Billy Sheehan, Pat Torpey and Paul Gilbert in MB and earning himself some long overdue platinum success. Listening back to the quality of work he was putting out prior to that, it's difficult to fathom why it took so long. This is a classic album and well worth a place in the collection of anyone enjoys melodic, early eighties Melodic Rock.